Concord 4 is a full-featured security system for intrusion and fire detection that complies with SIA CP-01 false alarm standards. 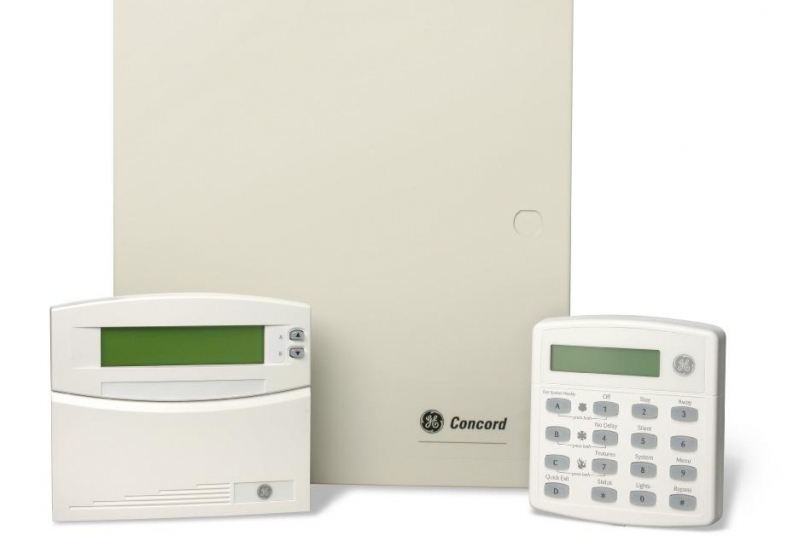 Easy to install and simple to use, Concord's modular design and advanced software provide outstanding system flexibility to meet the needs of virtually any residential or commercial security application. The panel comes standard with eight hardwire zone inputs, including a 2-wire smoke detector loop that can handle up to 20 detectors. A built-in RF receiver with 96-zone capacity provides instant compatibility with the complete line of GE Security Learn Mode sensors. Two programmmable outputs can be set up to activate external devices during an alarm or other system event. Expands Concord's capabilities by adding SuperBusR 2000 8z Input Modules for eight additional zones per module, or SuperBus2000 4-Relay Output Midules to add four more output points. SnapCardsTM also add to system zone inputs and outputs. Each card (one per panel) connects easily to the panel circuit board inside the cabinet for a clutter-free, professional installation. Increase RF coverage area by adding up to four SuperBus 2000 RF receivers or SuperBus 2000 RF transceivers. Each receiver supports all 96 zones. Expand the system even further with a Phone Interface/Voice Module for on- and off-site system control using touch-tone phones. The module includes a speaker output that provides on-site voice status and alarm messages. Adding a SuperBus2000 Energy Saver Module lets users control heating and air conditioning. The Power Line Carrier Power Transformer adds X10 light control. The Wireless Gateway Module allows users to control and monitor the status of the system from the Alarm.com web site. Increase power capability for system peripheral with a SuperBus 2000 2-amp Power Supply Module with battery backup. The module provides 2 amps at 12 VDC.